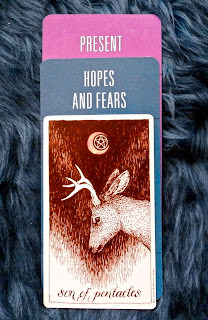 Today's Draw: Son of Pentacles from the Wild Unknown in the Present Hopes and Fears position from the Deck of 1000 Spreads. Are at one hopeful and afraid of a change you want to make in your life? Are you ready to throw caution to the wind? And what if you left this life without doing it...would you be ok with that? Sons, or Knights as they're usually called, are the crusaders of the tarot. They're on a quest. They're old enough to carry out that quest and make their own decisions, and young enough to take chances without fearing loss. There's a magic to that time in life when we have so few responsibilities that we can just throw caution to the wind. It is the Knight's greatest strength, but one that can lead to his downfall. I like that this Knight or Son is a young buck, because bucks carry that magic in my mind. I have a special relationship with bucks, going so far as to having shared a mystical experience with one a number of years back. It always amazes me that deer shed their antlers every year. So you see these 8 point bucks and all of that was grown within a year. You'd think forests and woods would be littered with shed antlers, but have you ever seen one? I haven't. I guess it's all part of the magic. So I hope to branch out in a new career as an author. I mean, I already am one, but I hope to make it my career one day. But it also scares me because it's unknown. Best-selling authors in the mainstream media earn big chunks of cash. And I'd like to write spiritual books that are more mainstream. But what if I fail? What if I can't cut it? If I were a Knight, I'd sell my home and live off the equity I have and spend all my time writing. It's certainly something that's occurred to me. And I've been known to take risks. But that's one I think I fear too much. On the other hand, I also fear NOT doing it. I really do enjoy my present career. I have plenty of opportunity to be creative and I write every day. But I really like having something that I can "own" as my own thing, like the Deck of 1000 Spreads. 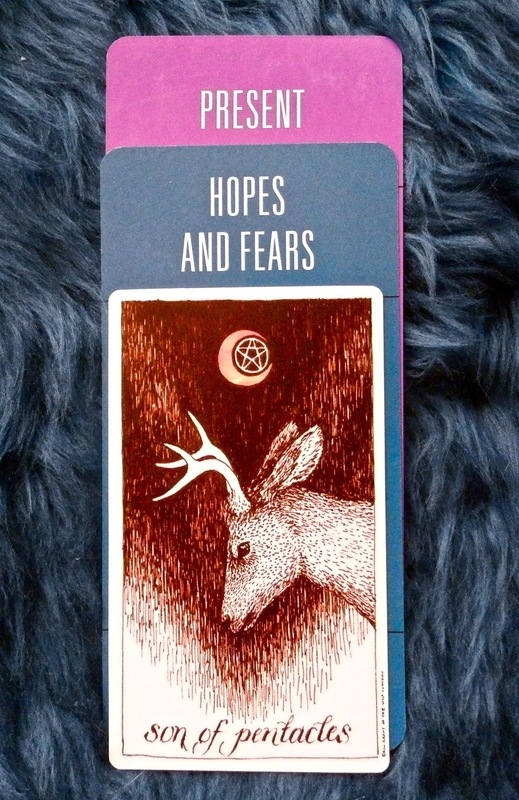 So that's how the Hopes and Fears card works. It's a little of both things...hopes and fears. And with the Son of Pentacles, it could be about a health initiative you're undertaking or a family change you're thinking of making, too. I often think that we can spend all our time in thinking and debating the hopes and fears that we never end up moving forward. I know I've spent a lot of time doing that myself. I've always imagined it like skydiving or bungee jumping...that you'd sit up there and noodle it until some second of time comes when you throw caution to the wind and just jump. Although I'd be too scared to do EITHER of those things...haha...you get the drift. But I also think that if I went all the way up in the air to skydive and then chickened out, I'd never quite forgive myself, you know? So I think there comes a time when we just have to throw caution to the wind and shed those antlers we've been carrying around all these years. Or forever wish we'd had. We all know what wishing and hoping feels like. Are we prepared to do that for the rest of our lives? I don't think I am. Because then I'd never know if this thing inside that tells me I MUST do this...I'm destined to do this...was right. I mean, what if we never managed to do something we came here to do? That's why we all have to eventually. Just. Jump.